Because of the very compliant nature of the Seismic Load Cells™, the speakers effectively float in the room at frequencies above 3Hz. Each bar comprises a very strong steel cross-piece with raised ends under which are attached two Seismic Load Cells™. When installed you experience The Seismic Effect! The sound improves dramatically, with wider stage width and greater depth and the sound becomes independent of the speakers. Bass becomes tighter and more real, with thuddy boom greatly reduced. A major plus is that the sound of the speakers is no longer transmitted through the structure of the building with the same intensity, so your neighbours will probably not hear your music! Conventional so-called rigid supports (spikes or cones) aim to hold the speaker cabinet 'still' at audio frequencies. 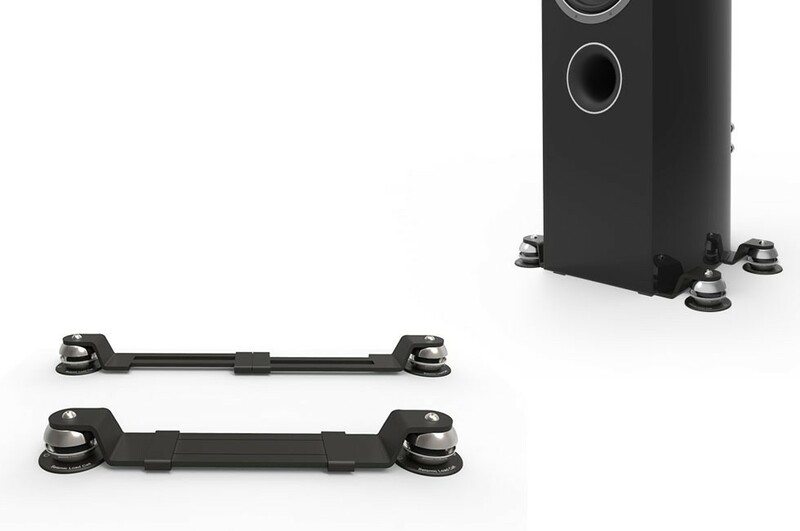 However, there will be coupling between the speaker and the floor and myriad resonance set up by the mass of the cabinet reacting with the unavoidable springiness of the floor, which can cause vibration of the building structure in the audio band. Rigid coupling also transmits ground-borne vibration into the speaker cabinet and thence to the speaker driver baskets where it is superimposed onto your music. By using Seismic Isolation Bars, you will be able to enjoy your music at its natural volume level, - as if you were listening to a live performance - without annoying the neighbours! To install, first, remove any spikes or cones from your speakers and slip one bar under the front of the speaker. Then tilt the speaker forward and slide the second bar under the rear. Very small adjustments allow for setting the speakers vertical. Even though the speakers are floating, it takes a very big push to topple them. 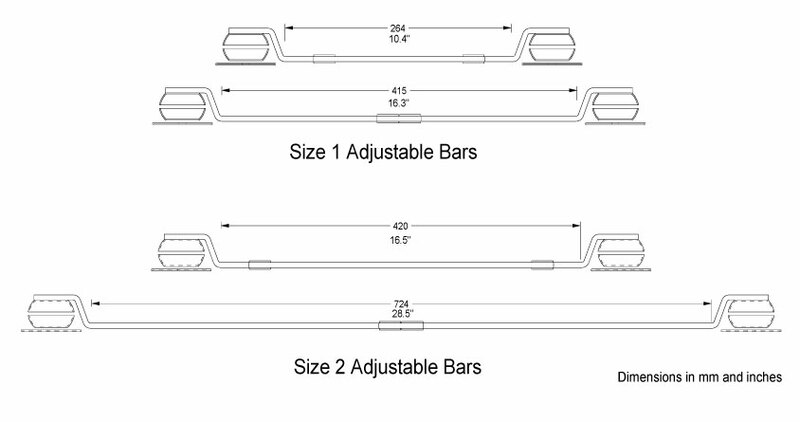 The Seismic Bars are available with five different weight range capacities, varying progressively from less than 5kg up to potentially over 75kg. We strongly recommend using Seismic Podiums for loads above 30kg if single-handed, or up to 75kg for ease of use and stability reasons, especially on equipment taller than 1m and/or high center of gravity. For example, when using four (4) type "C" Load Cells, the maximum supported weight should be equal to or less than 52.4 Kg, including the weight of the Podium base plate. Seismic Bars type/load capacity, four (4) Load Cell configuration.